More than 15 years of experience in bringing proven experience and leadership to growing businesses both organically and through acquisition.Demonstrated progressive leadership responsibility in the areas of strategic planning, corporate development, business intelligence, merger and acquisitions (M&A) and market research.A proven track record of increasing revenues and profits as a key member of Executive Teams. Open to Corporate Development or Strategy / Strategic Planning opportunities within the Internet, Mobile or Hi-Tech sectors.I bring proven experience and leadership for growing businesses both organically and through acquisition. I am an expert in serving both C-level executives with short and long-term plans for growth and business line leaders with the implementation of a repeatable, sustainable process necessary for execution. 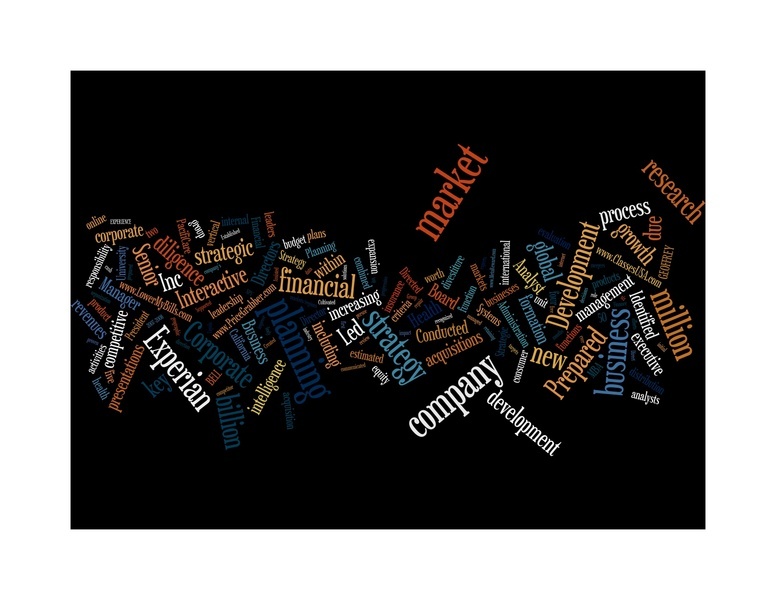 ·Identified, sized and analyzed over 50 markets for incremental growth, prioritized each market based on opportunity, measured internal capabilities, and identified competitive advantage based on analysis of customer needs through statistically valid consumer surveys.As a result, $80M of annual incremental revenue was generated from new product concepts and go-to-market strategies. · Produced go-to-market strategy for online retail identity theft and credit monitoring product for $100 million Consumer Services Division.Leader of $15M online marketing campaign for new product launch. ·Researched and analyzed ID Theft and Credit Monitoring market identifying new product concepts and features not currently in existence, including mobile retail transaction authentication, device fingerprinting for fraud reduction, and lead generation leveraging existing credit trade lines from consumer credit reports.Resulted in Company immediately adding concepts into product development queue. ·Project leader of online marketing strategy for generating website traffic and order growth.Implemented a multiple brand approach and various consumer promotions based on consumer preferences, market data and empirical findings. Developed market expansion plan for online lead generation business; analyzed competitors and identified customers within each new market. ·Identified 10 new markets targeted for immediate entry were included in FY2011 fiscal and 3-year strategic plans. Led the executive team in the formation of the group strategy for a $1 billion business unit of a global financial services company.Directed market research and corporate development functions and efficiently managed a $1.5M operating budget by recognizing more than $700K in annual savings. The company ranked as a Top 10 U.S. online advertiser with FreeCreditReport.com, LowerMyBills.com, PriceGrabber.com, ClassesUSA.com, ProtectMyID.com and CreditExpert.co.uk. ·Identified new market opportunity to improve competitiveness by further expanding the wholesale market for credit monitoring, worth more than $320 million in incremental revenues to the company over three years. ·Leader of primary and secondary research function identifying new, value-added direct-to-consumer products, including debt servicing and identity theft, worth more than $100 million annually over three years. ·Spearheaded planning for the divestiture of a $100 million business into a new company, retaining an equity position.Acted as the lead for the due diligence process, prepared board and executive level presentations, and reviewed proposals and agreement terms.Ultimately recommended, led and implemented a turn around strategy to restore growth. ·Established a new top-down strategic planning process for a 400+ employee base by aligning group plans with each functional area and employee performance plans, increasing accountability and commitment to organizational strategy. ·Cultivated internal and external networks of subject matter experts and prospective referral sources, including investment bankers and advisors as well as industry analysts. ·Led the Global Business Council that identified opportunities within new markets/regions, and facilitated the follow-up, due diligence and planning with market leaders, internationally. Identified the top 20 markets for geographic expansion, including the initial product development for two consumer-direct products into the U.K. and India. Led strategy formation and M&A activities for two business units: Interactive and Marketing Services with combined revenues of $1.9 billion.Led the global strategic planning process in a matrix organization involving 30+ business unit leaders.Prepared and presentedstrategic plans to Executive Management for approval. ·Led Corporate Development function including all aspects of due diligence, negotiating agreements, preparing financial and operational projections (free cash flow, NPV, IRR, etc.) for five acquisitions, representing a combined deal value of more than $900 million: MetaReward.com, LowerMyBills.com, ClassesUSA.com, PriceGrabber.com and AffiliateFuel.com. ·Identified four existing businesses that were key to international growth and subsequently launched into nine new countries including Japan, Spain, Canada, and Germany increasing revenue by $25 million over three years. ·Created 3-yr strategic and tactical plan identifying four key areas for future growth: product diversification, vertical and market expansion, media/site optimization, and online media distribution. ·Led market research and competitive intelligence functions. Performed primary and secondary research on macroeconomic trends, vertical and international markets, M&A targets, and their contribution to the Company’s growth plans. Managed the company’s competitive reporting/intelligence function. Created an internal competitive intelligence network, comprised of several regional business heads from six different subsidiaries for a $4 billion, global leader in consumer data and analytical solutions. ·Presented analyses and recommendations to executive management and the Board of Directors on M&A activity, special projects and key business developments. ·Achievements led to the first ever, global distribution of competitor tracking and benchmarking analysis at Experian. Supported M&A activities for a $9 billion health insurance company. Played a key role in the acquisition of an e-prescription company with software and handheld devices for physician use in the management of pharmaceutical prescriptions. Directed the divestiture process for a $75 million dental division of a health insurance firm. Prepared financial forecasts and managed due diligence efforts. Led the budget planning and financial forecasting processes. Led all phases of M&A process (proforma financials/valuation models, due diligence, presentations for VC Board, legal docs, closing transactions). Spearheaded five acquisitions within 12 months.